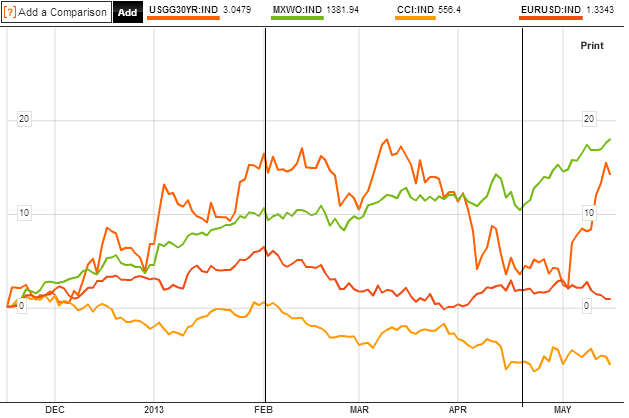 If a trend change occurred in late April then commodities and Euro-USD have yet to meaningfully participate. 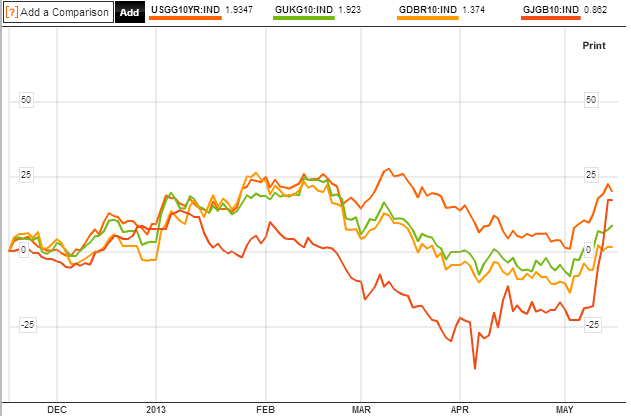 Stocks and bond yields however, have been strong. If equity markets are on track, per my forecasts, for a top around June, then the Nikkei has a potential resistance there from which it could pull back. Gold so far is progressing like the Nasdaq correction which I drew attention to HERE. I am looking for a higher low than in mid-April, or a lower low on positive divergence. As we are in the lunar negative period, we may need to wait until late May if it is going to eventually manage to break out upwards. 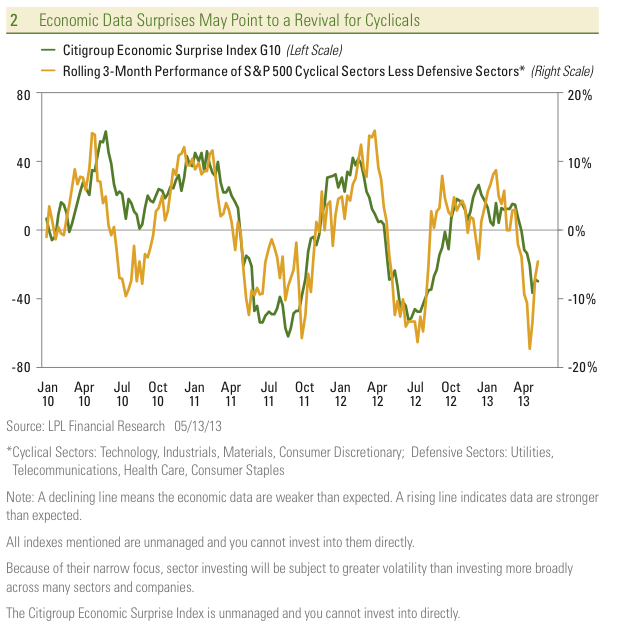 As economic surprises is a mean reverting indicator, the G10 indicator may have reached low enough to warrant a reversal. My overall projections remain the same. A mid-year topping process for equities and rotation into commodities. Leading indicators are showing sufficient health for this to occur, and narrow money predicts emerging market outperformance going forward, which would tie in with increased strength in commodities. I am looking to see a gold bottoming formation, and an eventual break upwards in oil, as supporting developments. The sharp rise in bond yields bodes well for my overall scenario as that was a missing piece of the puzzle, and should be accompanied by a rise in money velocity. Geomagnetism has flattened out, but by seasonality there should be improvement into June/July before a trend change donwards into the Fall. Daily sunspots currently remain close to the record so far for this solar cycle – strength that looks more promising for a solar cycle maximum ahead in the Fall. I am skeptical on commodities. The dollar looks like it wants to go to 89. The currently strong dollar is a problem for commodities. 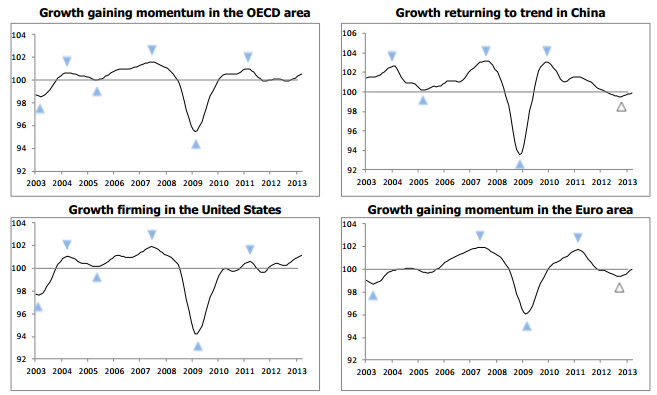 I suggest it’s due to a strong US stock market and better US growth than elsewhere. I expect these to change and the USD to then perform differently. Commodities in a down-trend from 2011, look at oil, US Dollar is heading up, my target EURUSD is about 1:1 or less in a couple of years or three. I can not see inflation. I Think is the opossite pattern than 2007-8.Us markets making highs and commodities in a down-trend or flat. By my correlations, inflation is always and everywhere a commodities phenomenon. So until/unless commodities take off, there won’t be much inflation to talk of. But I agree with your main scenario for the markets, a parabolic movement like 1909-16-19 megaphone top to see after an enourmus fall in the Dow Jones, about 40-46% at least. Thanks. I’ve studied all the main trading disciplines and I found Elliot Waves one of the least predictive. However, Tony, Pug and Alphahorn all do pretty well with them. My reasoning is they all have a good general feel for the markets, rather than EW making the success. I’m sure they would say differently. So, I respect his calls and maybe he’ll be right – but I would argue that if these EWers are navigating this particularly tricky secular transition period without other tools such as solar cycles, historic rhymes, correlations etc, then they are more likely to get it wrong. We’ll see! James Altucher is one of the very few market commentators who has been consistently right since March 2009 in that he has been constantly bullish no matter what happened. His prediction is DOW 20,000 by 2014 or early 2015 but then he would take profits. He does not see an asset bubble because stocks are relatively cheap. Do you think that Altucher may be correct in predicting DOW 20,000 by 2014 or early 2015? Or will the mid year topping process that you predict be the end of the stock market rally? My primary scenario is that mainly drawn together in the last post: inflation around the solar max; commodities performing under negative real interest rates; yields and money velocity rising; demographic trends and commodity inflation stopping US equities. I could envisage another scenario whereby equities continue to soar if yields and money velocity and commodities stay down. However that would be a historic anomaly.